Can I Pour Leveling Compound on Existing Vinyl Floor? A leveling compound is used to treat floors that are naturally uneven in order to provide a straight surface for laying many types of tile. Most leveling compounds are sold in bags of powder that are then mixed and added to floors as needed. It is a common step in home renovation and remodeling, and many types of leveling compound are made for use on a wide variety of materials. If you can avoid it, you should probably not use a leveling compound on a vinyl floor. Leveling mixes are designed to make smooth surfaces and are most often used on concrete or wood. 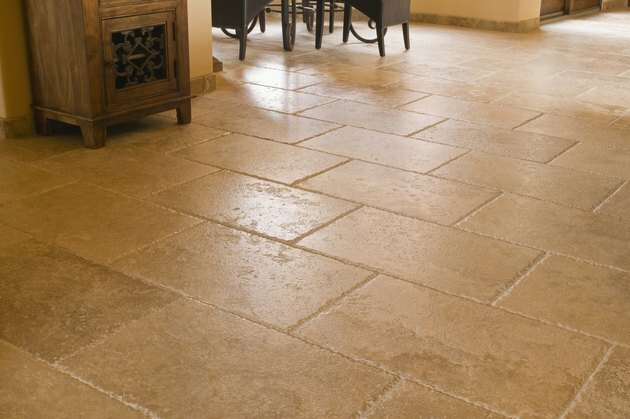 Concrete often has scratches, holes, marks, and drips that create a very uneven surface that cannot be used to lay tile, while wood boards can warp over time, creating hills and valleys instead of the straight, smooth needed for proper tile insulation. Leveling compounds cover up these flaws with a putty mixture that provides a good base on which to build the tile. In construction projects, leveling compound is most often laid down on the subfloor before the floor is even set. To properly install a new tile surface, you should remove the existing vinyl tile, grind down as much of the old tile adhesive as possible, and then apply the leveling compound to smooth out the surface for the new tile. It can be confusing because many leveling compounds are marked as useable on a variety of surfaces, including linoleum and vinyl. Just because the product can be used on vinyl does not mean it should be, and trying to bond one layer of tile over an existing layer of tile can cause problems, since the top layer of tile has to depend on the structural integrity and bond of the lower layer for its strength. Regardless of surface, you should try to use a primer before applying the leveling compound. A primer is a type of latex paint that will allow the compound to settle more easily and bond more purely with floor when it is dried. When you use a leveling compound, make sure you follow its mixing instructions precisely, mixing in a large bucket. If you have a power mixer or a drill mixer, use it. Try to aim for a thick, milk-shake consistency before you begin to use it. Begin by pouring the mixture on the lowest places on the floor and wait for it to settle a little before spreading it at the edges with a trowel. You will probably only have ten to fifteen minutes before the compound settles, so speed is important.